This blog should have been showing some interesting snaps from a cruise down the Ayrshire coast and around the dramatic island of Ailsa Craig, from the beautifully preserved paddle steamer ‘Waverley‘. 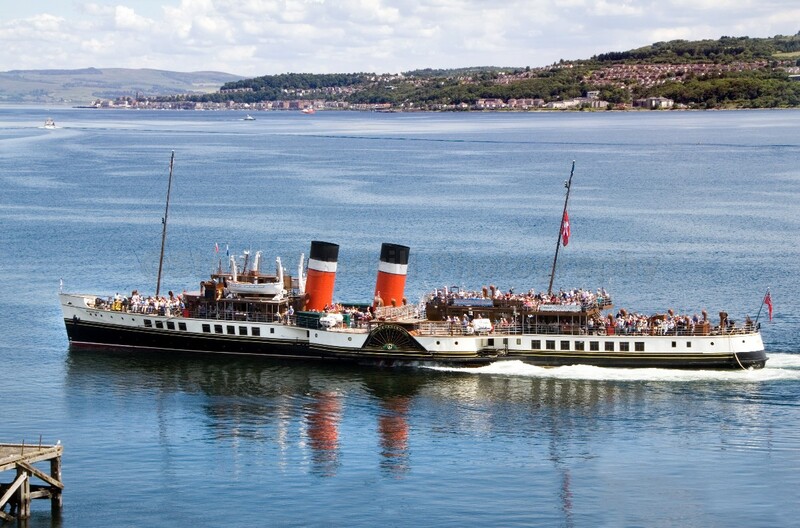 The paddle steamer ‘Waverley’ from a previous encounter at Dunoon. Alas, the historic ship has a bit of a reputation for being rather unreliable and the trip was cancelled at the last minute. So, I switched from sea to rail and took a journey from Ayr to Stranraer by train on what must be one of the country’s most scenic rail journeys. 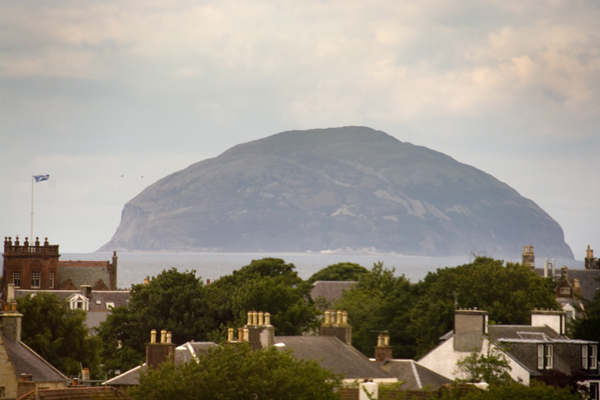 I did still see the curious volcanic island of Ailsa Craig however and caught a snap with the rooftops of Girvan in the foreground. My zoom lens exaggerates the size of the island and makes it look very close to shore by the way. 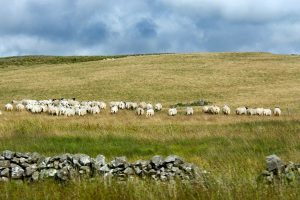 Beyond Girvan, the train climbs steeply and the line twists and turns through woods, across viaducts and through a tunnel emerging into a bleak very sparsely populated moorland landscape, with the main inhabitants, some hardy sheep. 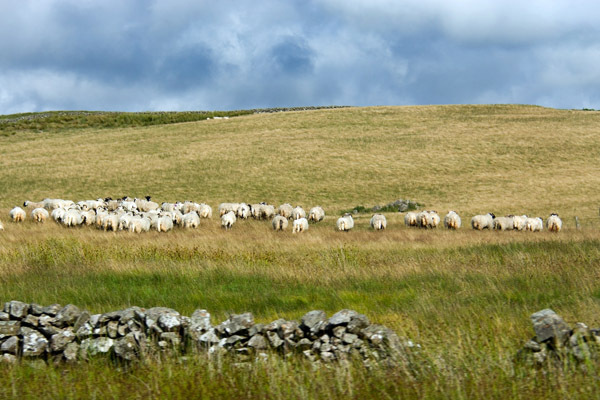 Sheep are the main inhabitants. Lovely Scenery between Girvan and Stranraer. 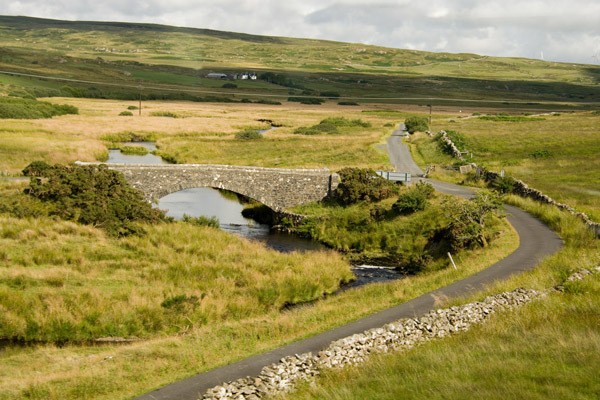 This picturesque bridge caught my eye, making an attractive focal point in an otherwise bleak landscape. The road gives a sense of depth. Most of these photos are taken through the window of a moving train, which requires a particularly quick finger on the shutter button and good forward planning! Fortunately the window was fairly clean and I managed to dodge most of the reflections (or edit them out later in Photoshop). Weed covered tracks at Stranraer. Now, if the countryside on the way to Stranraer was bleak, then the state of the terminus station at Stranraer was even more so. 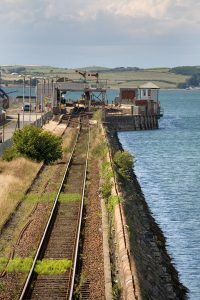 The once busy harbour and passenger terminal for Ireland closed in 2011, with all shipping moving a few miles up the coast to Cairnryan. Left behind is a very sad scene of neglect; rusting rails and signals and a wasteland of fenced off weed covered tarmac. 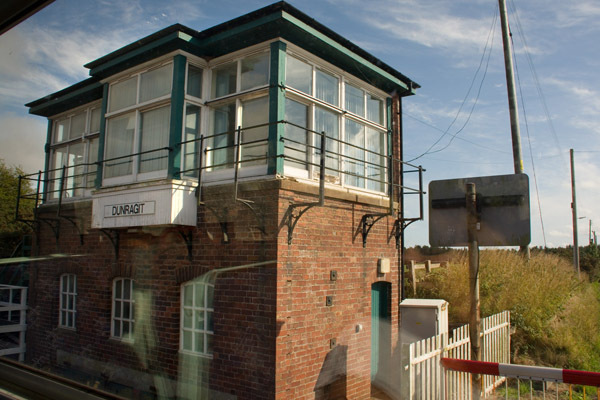 The train service hangs on by a thread it appears and has often been threatened with closure. Stranraer’s Castle Of St John. Without wanting to be too unkind, there isn’t much to photograph in the town of Stranraer; a rather run down ‘outpost’ in a remote corner of Scotland. 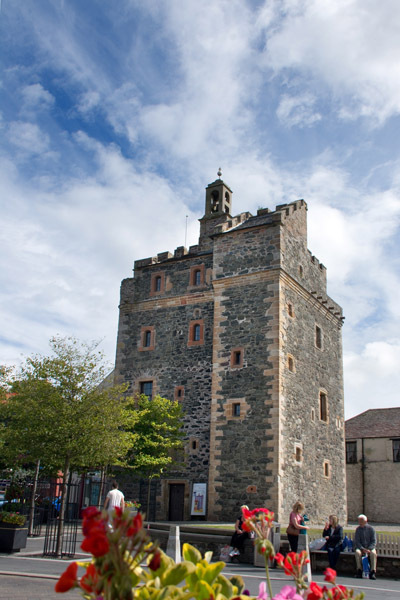 The 16th Century castle of St John however, stands proudly and well preserved in the centre. My shot benefited from the lovely sky and a few flowers in the foreground to add a splash of colour, rather lazily taken from outside the cafe where I was enjoying tea and cake! There are some signs of rejuvenation in Stranraer and some pleasant shops and it certainly is a wonderful spot to admire the view straight up Loch Ryan. 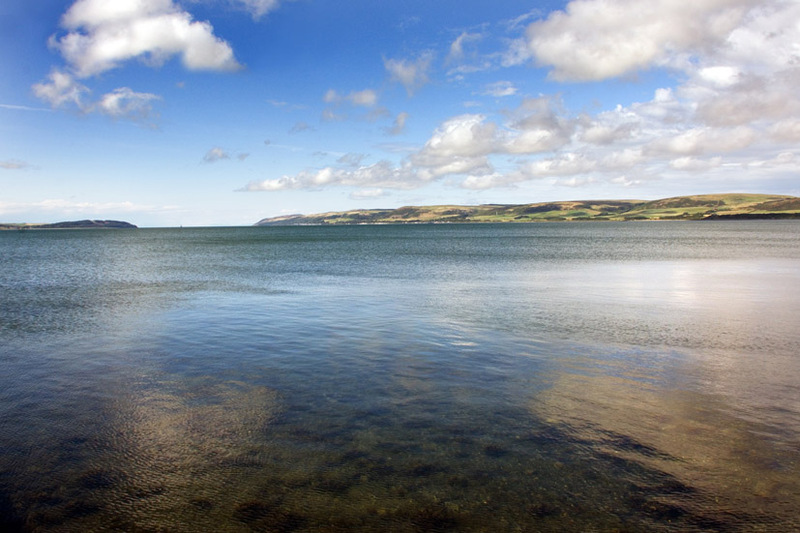 Looking Up Loch Ryan from Stranraer. With the water looking very calm and clear and clouds reflecting nicely (and not having to photograph through a train window! ), I was pleased with this shot. Despite the appearence, the loch is actually a fairly narrow sea inlet, one to two miles wide that gives the south west corner of Scotland it’s distinctive shape on the map. 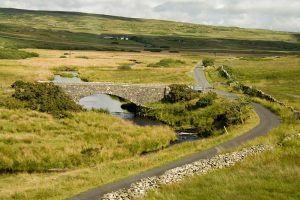 It’s also the exit and entry route for ships to and from Northern Ireland, which is little over two hours sailing from here and is well served by modern ferries to Belfast and Larne. 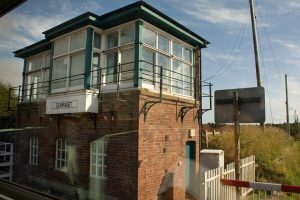 Back on the train to Ayr and a few miles east of Stranraer is the very Scottish sounding Dunragit with it’s signal box and level crossing. Shortly after this the line bends north with the former ‘Port Road‘ to Dumfries continuing straight on. It was a victim of the Beeching axe in the 60s. No doubt had the line survived, the huge rail detour via Ayrshire would have been avoided and Stranraer remaining more prosperous. Before heading north, we briefly see Scotland’s south coast and Luce Bay. 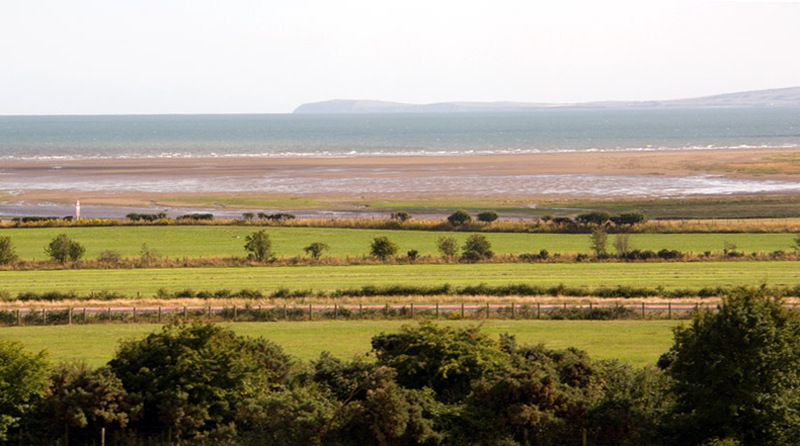 The Rhins Of Galloway is just visible on the horizon and to the left the mountains of Cumbria would be visible if clear. 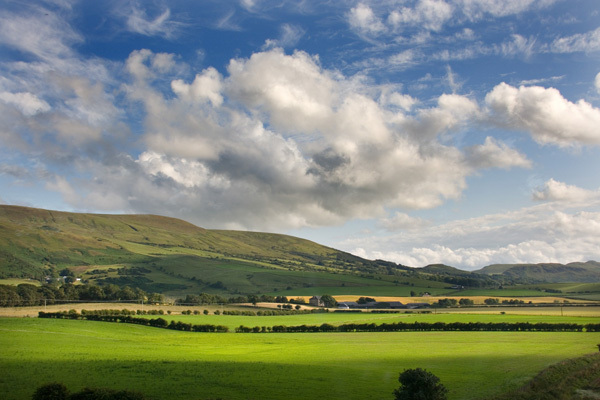 As you travel further north towards Ayr, the landscape becomes more ‘soft’ and to my surprise rather greener than expected, despite the recent lack of rain. One final shot was this one, when a lone horse on a hilltop caught my attention. 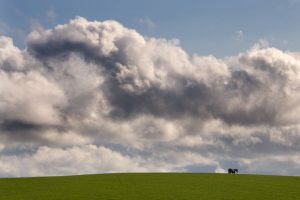 I loved the contrast in scale between the tiny horse and the billowing clouds above. I deliberately cropped the image to place the horse towards one corner, to give a better balance. 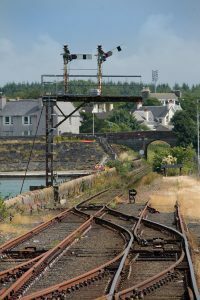 I hope you have enjoyed my brief look at the Ayr to Stranraer railway. If you are ever in the area, do explore this lovely tranquil corner of Scotland and whether you are roaming with your camera at sunrise, or just being a lazy chancer snapping out of a train window, have fun and happy snapping! More Photographer’s Ramblings coming soon….